Everything about Mollies and how to care them! What is good food for Mollies? What do mollies eat? Just flakes and thats it? We are going to look at some of the good and the bad. It is important that you are feeding right food and right amount to your mollies. Otherwise your precious mollies will end up getting sick or even worse. You are what you eat applies to fish also! Luckily feeding Mollies isn’t rocket science if you follow basics. Mollies that live in the wild are mainly omnivores and feed on algae, plant matter and small invertebrates. However when kept in aquarium, mollies should be fed quality flake food and a wide array of vegetables. The new life spectrum small fish formula is one of the best high quality prepared foods that you can feed them. Their favorite vegetables are: shelled peas, cucumber medallions and zucchini medallions. For those who do not have time to blanch or cut vegetables, a spirulina based flake or pellet can be an alternative to plant matter in their diet. Mollies are mainly vegetarians, but they like to have some protein based food addition to their diet. Did you know that Mollies actually have small teeth and they chew food? Like other livebearers they eat or taste almost anything they can get hold of. Mollies tend to chew and eat plants and vegetation in tank, but that’s because they are always hungry and they will do almost anything for food. Regardless of how regular you feed them, they will still beg for more. You can also add other foods to their diet by offering frozen krill, frozen mosquito larvae and others. Always look for the “freshwater” label when buying such foods from any local pet store as they usually have frozen food for other marine aquarium fish as well. And then instead of dropping the whole cube into the aquarium, first cut part of the cube off before dropping it into the water. How often you need to feed Mollies? When you feed them and notice that they are spitting the food, it means they have had too much. But they usually go after the spitted food even though they are full. You can feed them once or twice a day like most people do. They will do fine with that. When you feed them with flakes remember to crumble the fish flakes into small bits so that they can have an easy time eating them. Keep in mind that you can feed them twice or once a day and they won’t mind at all. They usually eat within 5 minutes, and if you continue to drop more food into the tank, they will keep on eating but they will spit it out which means the food will end up settling at the bottom and make a real mess to the clean water. How to feed Mollies to get them Breeding? For those who want to get them into a breeding condition feed them on frozen or live foods for a treat. It will make a huge difference and most likely you will get better results in terms of breeding and your fish well being. Some of their favorite frozen foods include; brine shrimp, daphnia and blood worms. You could also try to make your own molly fish food. It could be lack of fresh food in your mollies diet that causes them not to breed. One of the most important things that you can ever do for your fish is to feed them in small bits. The main goal here is to make sure that your mollies can handle and eat what you feed them before most of them fall to the bottom without the fish eating them. This will be a big issue because the food ends up sinking to the bottom which contaminates the water. Additionally decaying food raises nitrate levels in the water which is a common fish killer, so feeding them in small bits after sometime is the best. 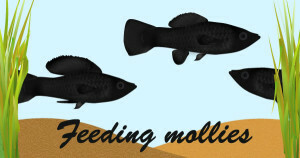 Hopefully the article has given you some good ideas on feeding your molly fish awesome and great food in the most appropriate way. Nevertheless do not forget that mollies also like other foods other than tropical flakes. Of course they seem to enjoy and get excited over flake food, but everyone including fish likes a little variety here and there. Do you want to eat same food everyday? Thank you so much. The information wasn’t over the top full of scientific jargon I would never remember like so many other sites. It was comfortably easy to understand and now I have more confidence in caring for my 55 gallon molly tank. Thank you for your kind words! How many mollies you have in you 55g tank? Check new post “how to make your own fish food” if you haven’t done homemade food for your mollies. I recommend to start with frozen peas (microwave them and remove shell with fingers) and add some crushed/sliced garlic. No salt, sugar or any other spicing on them! Both seem to help fish to digest food better especially peas. We recently purchased 9 mollies that are pretty big, about an inch to and inch and a half. We have a 55g tank and we epicly failed with guppies. We also have 8 tetras, a placo, and about 8-9 guppy fry. What I’m trying to figure out is how much to feed them all. It seems like the mollies will eat all the time if I let them. However, I’m concerned that they gobble up all the food before some of it can sink far enough for the fry and the tetras to eat it. I’m worried I’m going to overfeed the mollies and make a big mess in the bottom of my tank trying to get food to the other fish. So far we are just feeding them flake food but based on your post, I’m definitely going to branch out. Will the other fish in the tank also eat the frozen food and algae disks? Do you have any suggestions on or maybe reassurances about the other fish getting some of the food I’m putting in the tank? Right now we feed them about 2-3 times a day. I put a pinch in and judge how quickly they eat it and then put more in based on that. But I feel like I’m putting in way more than I need to. Sometimes I’m putting in like two or three pinches a session. It seems like they are eating all of it in a pretty fast period of time. Any advice would be greatly appreciated. I think your plecos should be fine. They are really tough and will find something to eat (as a last resort – your plants). Maybe try to spread food evenly and use food that will “last longer”. Pellets or my favourite frozen peas that have been microwaved and deshelled. Peas could work as mollies can’t eat them straight away. Also you could try steamed or boiled (remember: no salt, spices or anything) small broccoli. Mollies, platys, swordfish and plecos seem to like broccoli escpecially flowering part. Peas and broccoli don’t creat “cloud of food” compared to flakes and if they are heated, they will sink fast. Try small amounts first, you can add more later. They idea would be that mollies are too busy eating fresh food, sinking or floating and that gives other fish chance to join the party. Mollies are quicker than guppies or tetras and they are always actively seeking for anything to eat so I can’t guarantee it will work. 2-3 times a day is quite a lot but, it depends how much you give them. Try measuring with teaspoons to find out roughly how much you are giving. Pinch is really difficult to measure. I’ve found out that automatic feeders are not a bad thing. Sometimes you just forget feeding or someone else in the family has already given some food. I’ve had many automatic feeders, but this Eheim feeder is reliable and easy to use…. if you adjust the opening and test it before installing it. Also remember to mark opening setting with white marker. Hi, I need the details of Gold doubloon molly fish nutritional level (protein, CHO, lipid, vit & min). Please, Can you explain that. and what to feed to babies and how to feed them? How much fish food should feed Molly fish in one day? My white Molly male fish’s upper fin become black, why? What Should feed to Balloon Molly fish Babies?? How can they eat the feed? is there any way to feed them the balanced diet?